When your 90-day tourist visa is about to run out for Guatemala. It’s time to visit Mexico! OK, so you’re a student from Europe, Canada, or the U.S. and you’re studying Spanish in (Xela) Quetzaltenango, Guatemala. When you entered Guatemala you received a 90 day tourist visa, but that’s not long enough to really get the language down. Before your 90 days are up you need to renew your visa in the capital, Guatemala City (about 4.5-5 hours away) or you can get a fresh new visa good for 90 days by leaving the country. Time to head to Tapachula, Mexico! 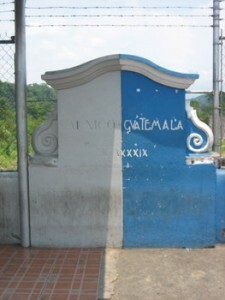 At the end of 90 days you will need an extension or a new stamp in your passport to legally remain in Guatemala. That’s why you’ll need to go to Mexico. Some people say they require you to be gone for 48 hours, but we found that by leaving on Saturday and returning on Monday, we were able to gt the stamps we needed without any problems. Don’t try get your passport stamped on an outing to Honduras, Beliz, or El Salvador or you’ll find yourself with an old tourist visa and no new stamps! These countries don’t have to re-stamp your passport because of the transit agreements they have with Guatemala. Mexico is your best bet since they stamp your passport and you can get a new Guatemalan visa when you return. Besides, Mexico is only about 4 hours from Quetzaltenango and transportation is pretty easy to arrange. there are travelers who are needing to renew their visas and want to make the trip with you. We used Atlantida Toursbased out of Quetzaltenango. Our guide was Hansy. 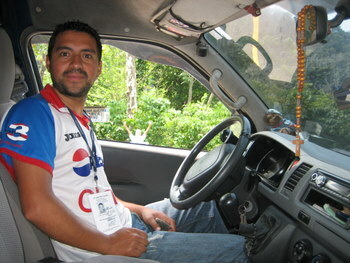 Hansy is a good driver, punctual, informative, safe and he speaks excellent English! 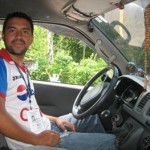 We paid US$80 per person for transportation to and from Tapachula to our house. Their exchange rate for US dollars to Quetzales was terrible so we just paid in dollars. Things to see. We asked around and the San Fransisco Hotel was recommended. It turned out to be a nice place for us to stay. 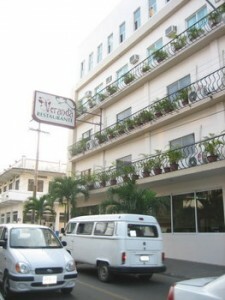 Cost for our double room was US$65 per night and included a nice breakfast buffet. The pool looks bigger on their website than it really is, but we were the only ones enjoying it the afternoon we swam so we had no problem cooling off. We did some shopping and traveled about via taxi so that added to our overall costs, but if you just want to relax and hang out at the hotel your visa run can be pretty inexpensive. Tapachula itself didn’t seem too exciting. As a center for commerce, it struck us as more of a passing through point than a commercial center. There is a nice mall but prices are high. markets and had no problems, but we helped keep an eye on each other. There’s a large market area near the Central Park. 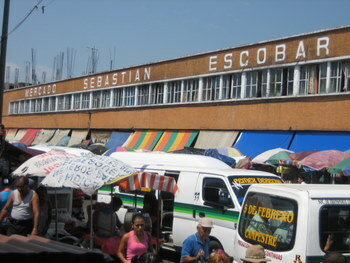 The Mercado Sebastian Escobar has all sorts of regular household goods, food, spices and more. Note: Sunday isn’t a good day to find any typical handicraft items since most of these types of stories are closed on Sunday in Tapachula. Do your market shopping in the morning. We went out one afternoon and found much of the market closed. Connected to the large box store Chedraui, the Tapachula Mall has a variety of stores, a food court with genuine Mexican food, Chinese, and American restaurants. The mall has your standard selection of clothing and specialty stores plus a theatre provides movies to the local population. 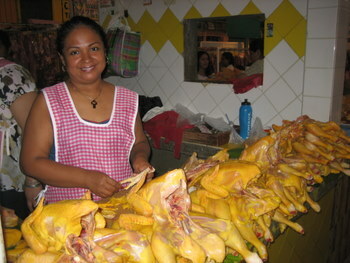 The international fair at Tapachula’s fair grounds are held annually around the end of February. From what I can tell, this looks like a pretty big deal if you’re in town during that time. The Pacific Ocean is only about a half hour away (according to our taxi drivers). We didn’t visit but that could be an enjoyable outing. This seems to be the place to get your bulk items. We heard from many Guatemalans about how you can get great deals in Guatemala…if you have a membership card. We didn’t so we weren’t able to find the legendary deals they spoke of. Apparently there are some taxes that you may be required to pay if you stay in Mexico longer than 7 days, check out this site for details. You can also make trips to other cities in Mexico for the same renewal of your passport tourist visa. We chose Tapachula for it’s proximity to Quetzaltenango. We are going to be in Guatemala for a while so we have been looking into other options so we don’t have to keep making trips out of the country. You can read about options we found here. This entry was posted in Resources, Travel and tagged Guatemala, passport, stamps, Tapachula, visa, visa run by michaelshead. Bookmark the permalink.